A Sinn Fein MLA has demanded action from Northern Ireland’s police chief over a crime spree that is targeting Mass-goers at local churches including Aughnacloy. In the latest incident, eight cars parked outside Aughnacloy and Dromore churches were broken into while the owners were attending services. The PSNI are investigating after churchgoers reporting losing various personal items. Sinn Fein MLA Barry McElduff raised the issue last week at the Northern Ireland Assembly, demanding more help from the PSNI Chief Constable to combat the crime wave which has also struck at Strathroy, Carrickmore and Trillick churches. According to the Minister of Justice David Ford, a single investigating officer has been appointed to lead the hunt for the callous thieves, and crime prevention advice has been delivered to local churches. In Mid Ulster, a Text Alert Service has been used by the local clergy to receive updates on any suspicious activity in their local area. “I understand the impact that this type of crime can have on individuals and of their sense of safety in their own communities”, he added. 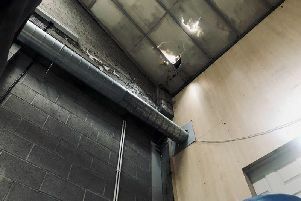 Some parishes in South Tyrone and Fermanagh have resorted to mounting their own patrols to combat the thieves, who have struck as often as four times in the one week. Over 70 parishioners have volunteered to patrol the two church carparks in Knockninny, Fermanagh, during church services to deter potential thieves. A supervision rota has been in place since November, with a pair of volunteers in hi-vis jackets patrolling each carpark during every Mass. A similar scheme is in operation at Dromore church, Co Tyrone, where five separate services were targeted in recent weeks.